jacmac wrote: I was asking, what is your point about saying that electricity only does work in atmosphere's ? Understood. That entire section was "Devil's Advocate." I was intentionally outlining the other side of the argument in hopes of stimulating conversation because the current trend of complaining about definitions is taking us no where. Hennes Alfven, Electric currents in Cosmic Plasmas, Page 16 wrote: "Hence in order to understand the properties of a current-carrying plasma we must take account of the properties of the whole circuit in which the current flows. As this is not done in the magnetic merging theories, we conclude that they give a basically erroneous description of the phenomena even if a change in the current really produces a field-line reconnection." Hennes Alfven, Electric currents in Cosmic Plasmas, Page 17 wrote: "It is well-known that all electric circuits containing an inductance L are intrinsically explosive in the sense that if the circuit is disrupted anywhere, the magnetic energy is released at the point of disruption ... The result is that the energy W(subscript L) may be released in the double sheath, where it causes an explosion." "Even if" mainstream science ignores the particle aspect of plasma (electricity) in favor of the field aspect (magnetism), after spending 15 pages saying MR is not possible because the particle aspect of plasma is ignored, he then concludes with a jab at definitions and an admission that magnetic energy released into double layers causes them to explode. The second half of this paper was completely speculative, and, to his credit, he admitted as such. I think that first paragraph you cited is the key. 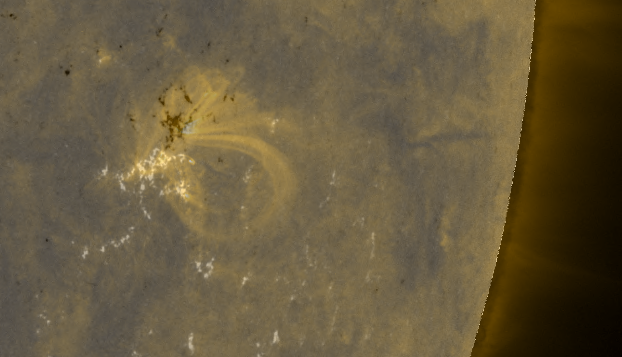 If one doesn't include the full circuit and all the circuit energy, it's virtually impossible to explain how a single coronal loop achieves million degree temperatures and sustains them for days and weeks on end. I don't think anyone denies that stored magnetic field energy can be explosively released when the circuit is disrupted, but it's really the circuit energy that's sustaining the process, and 'stores' the magnetic field energy in the first place. I think the real question is what *exactly* is the physical difference between induction in a plasma conductor, and 'magnetic reconnection'? You probably made a mistake. A MRI scanner does this with multiple Teslas and nothing ever got explosive. This is far more than what is present on the sun. Magnetic fields have no energy. Just like electrical fields have no energy. and this does not cost much energy. and weaker with a strong magnetic field. the change of the electrical current. (Used for that purpose in electrical circuits). In that sense you can use the magnetic induction of a spool to get an explosive effect. But for that you need a lot of windings in your spool. The change of a magnetic field can cause an induction current. react. Not just concentrated in one area. So no explosive effect of any kind. That is why MRI are relatively safe and don't fry your brains. Ya, I think that my biggest mistake is trying to deviate from the circuit/discharge/double layer approach when discussing high energy plasma events. I tend to get sloppy in my verbiage and cause confusion when I try to frame things from the magnetic field perspective. I'm guessing that's why Alfven simply stopped doing it too. I was *pitifully* (and poorly) trying to express/convey the concept of induction due to the changing magnetic field, but you're absolutely right it's an "electrical discharge" driven event and most of the kinetic energy comes from the discharge and the circuits. Forgive my sloppy verbiage and any misunderstandings as a result of my poor choice of words. All that is true of course, but as the field changes, as you also noted, it will induce charged particle movement in the plasma. Admittedly it's not the primary cause of the discharge however. I can't find anything to disagree with you about. I think I'll just stop trying to frame things from the field perspective. It always seems to cause more confusion than it's worth. Sorry about that. Michael Mozina wrote: I tend to get sloppy in my verbiage and cause confusion when I try to frame things from the magnetic field perspective. I sometimes get sloppy too. I think the magnetic field perspective is a general problem in astronomy. OR (2) only affect electrical currents. AND magnetic fields can not exist without electrical currents. Electrical fields on the other hand can be static. There is no change needed to produce any current. Just some kind of conducting connection. And if there is a short-cut the electrical fields can produce enormous amounts of energy. And that is exactly what we are seeing in the solar flares. Most currents are simply connecting different electrical charges around the sun. Which gives these currents a very stable position, until they are discharged. sun and cause solar flares. that the "flux-lines" on the sun are actually electrical currents. This observation breaks with the mainstream ideas of the sun. The lines might be influenced by magnetic fields, though. and that is not the same as following magnetic field-lines. actually caused by a perpendicular magnetic field. Why is this so difficult for mainstream astronomers? But to add Maths to the mix..
can we make a plasma simulator that calculates the movement of plasma on the sun? I believe that it would not be too hard, because it follows known physics. Also made a few movies (see link). The currents are clearly between the black spots and the white spots on the "magnetometer". it is the electrical field with the Stark effect. Both effects look exactly the same. On the sun we see clear plasma currents between the black and white spots. So, these black and white spots must be electric charged regions. I think I also understand how they cause flares.. The current is positive on one side and negative on the other. positive and negative on the same sides. This causes the new current to repel the older one, into space. with nuclear reactions if the current is very high. (X-class flares). expert when mainstream science is so wrong about the sun. I also see the Zeeman effect being used in many astronomy articles where magnetic fields are mentioned. These are likely to be Stark effect (electric) in those cases. I’m not disputing your analysis and do get that Stark and Zeeman effects both show spectra quantization in the presence of electric and magnetic fields, as used in solar spectroscopy; but wouldn’t the polarization of the light sampled be opposite in the two cases? Or at least polarized / unpolarized; as the two fields are transverse to each other ? Wouldn’t that be obvious to the people doing the solar spectroscopy, especially as the ‘hoops’ make a complete 180 ? First time looking at this, so would you have a couple quick links to where MS has misinterpreted the spectrographs, for some background? I have not read about that. The examples show the effect in all directions. This image show how the bands look in different field strengths (A= no field). The effect gets stronger with stronger fields. It seems to me there is no difference. Except, with electric fields the sun suddenly becomes a lot easier to understand. Watching "Blinded by the Sun"
It seems to me that Wal Thornhill also believes that we are seeing the Zeeman effect. And in his lecture he tries to find the complex electric currents that drive these the magnetic fields. But if we see this as the Stark effect, the models become much simpler. Also the Electric Sun models. So, even in the Electric Universe, it is not well known that the Stark effect looks exactly the same. to more bands. But that needs some more study. Zyxzevn wrote: Watching "Blinded by the Sun"
Just watched that video you linked (from EU 2014), and i didn't hear Wal mention solar spectroscopy. ? He does attribute coronal 'holes' to electric currents, and states that the currents generate magnetic fields. I'm trying to understand how your attribution of line displays in solar spectrographs being the result of Stark, rather than Zeeman effects, produces a different model than that presented by Thornhill and Scott ? Could you please give some description of your model vs the Thunderbolts/EU model ? seasmith wrote: .. i didn't hear Wal mention solar spectroscopy. ? ..
You are correct. That is what mainstream astronomers write in their papers. Thornhill just references to these reports as "magnetic fields" and assumes that they were actually found. other magnetic fields. And is correct in that it is not a valid explanation. over gravity, turbulence or centrifugal force." goes from one "magnetic island" to another. As I described above these "magnetic islands" are actually charged regions. Otherwise no current would exist. Instead of having observations of "magnetic fields" we often have observations of electric fields instead. with a bad understanding of electromagnetism they invented the magnetic reconnection unicorn. I have no different model than the EU / Thornhill. Rather, I have no model at all. I am still learning. But I see that the mainstream is misinterpreting the observations of the Sun. This is true for whatever model you are using. And it seems that Thornhill fell for it a few times, since he actively talks about magnetism on the sun. I think that even he trusted the mainstream astronomers too much (on that observation). The model that Thornhill describes seems to work better electric fields anyway. As I understand it, the penumbra are a current between two opposite charges. These charges are visible in the Stark effect in the video I uploaded. They appear as black or white, depending on the polarity. very wrong for any known physics. Frozen in "laws" of plasma? Oy Vey. The activity confirmed the theoretical descriptions of magnetic reconnection. But it violated the standard law governing the behavior of plasmas -- clouds of charged particles that comprise, for example, the solar wind. "The 'plasma frozen-in law' says electrons and magnetic fields have to move together always, and suddenly that does not apply here," says Egedal. "It's the clearest example ever to be measured in space, and it blew my mind." Sometimes the statements in these articles and papers make cringe. They make me wonder if these guys even have a clue about plasma physics and physics in general. In spite of Alfven's warnings about the dangers and limitations of using the "frozen-in' concept with respect to plasma, they're now calling it a "law", and they claim that 'magnetic reconnection" breaks that 'law"? What?!?!? Maxwell's equations do indeed solve for both E and B, but it pains me to see the mainstream constantly trying to put the magnetic cart in front of the electric horse. You'd think they'd eventually figure out that circuit theory and the E orientation of plasma physics is a better way to describe these same events, but nooooooooo! Somehow they still believe that the bogus 'frozen-in" concept must apply to something as mobile as plasma, and they associate the breaking of a fictitious "law" with "magnetic reconnection". Oy Vey. Didn't any of these guys study basic EM field theory and/or circuit theory in college? If the electrons move off in a new direction, then clearly there is no actual "law" related to frozen-in lines in plasma. Even the concept of using the term 'frozen" in reference to plasma makes no sense at all. Plasma isn't 'frozen' like a solid, and the electrons are simply following the path of least resistance. How can simple electrical processes in plasma "blow their minds"? How can they call this concept a 'law' if there's a known exception? Astronomers have literally turned every aspect of astronomy into pseudoscientific metaphysical mysticism. What a bunch of absurd mumbo-jumbo and pure word salad. They claim that there are 'laws" that aren't actually laws at all, and they talk about 'frozen' plasma that cannot possibly be 'frozen' in the first place. It's like watching kindergartners trying to explain quantum mechanics. FYI, here's the link to the paper, but it's behind a paywall. I see no point in reading it since the abstract talks about a 'law' and a supposed violation of that 'law'. Apparently they don't know what a "law" of physics is, and they're still ignoring Alfven's warnings even when they can see the "frozen-in" concept fail right before their eyes. Fully kinetic simulations of asymmetric magnetic reconnection reveal the presence of magnetic-field-aligned beams of electrons flowing toward the topological magnetic x line. Within the ∼6de electron-diffusion region, the beams become oblique to the local magnetic field, providing a unique signature of the electron-diffusion region where the electron frozen-in law is broken. Someone should clue Egedal into the fact that a "law" is only a "law" if there are no exception to it. At best case, it's more like a 'rule' that is made to be broken by electrical processes in plasma. "Magnetic reconnection violates plasma law in new study"
About the impossibility of "frozen-in magnetic fields". is used as evidence for the presence of magnetic fields. on conductive materials. So this would also work on plasma. I think it would be possible to do the same experiment with a conductive fluid. slows down due to eddy currents. It will a show a whole different effects than what we see on the sun. As an EM specialist, I am just amazed how persistent this magnetic reconnection unicorn is in astronomy. And that no-one calls them out on it.